Kathie will paint a beautiful portrait for you. 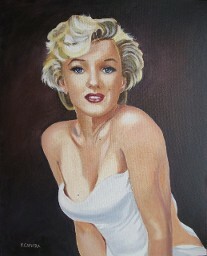 Check Out more portraits and prices and commission information here. Here are some of Kathie's recent portraits. The first is Serenity Rae, Kathie's 1st great grandaughter. 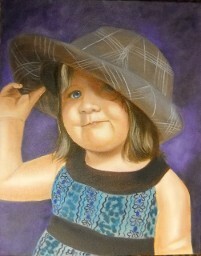 This painting, "My Chapeau" won 3rd place in the SLAL's Fall Art Show 2010. 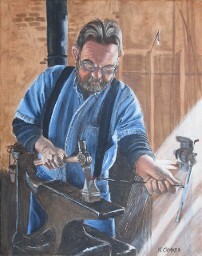 The second painting, "The Blacksmith" won a People's Choice award at SLAL's show in 2013. In 2015, it won Honorable Mention in the Martin F. Weber International People, Pets & Portraits Painting contest. 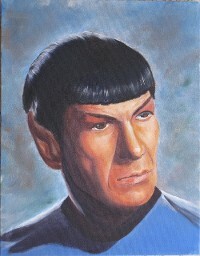 You will, of course recognize the portrait of Leonard Nimoy as the Enterprise's Science Officer, "Spock". More of Kathie's celebrity portraits. Starship Enterprise Captain James T. Kirk (William Shatner). The iconic Marilyn Monroe. 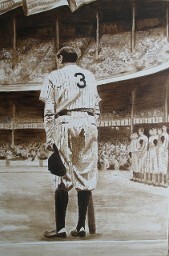 The famous Babe Ruth retirement (The Babe Bows Out) at the 25th anniversary of Yankee Stadium. I sent my portrait of Capt. 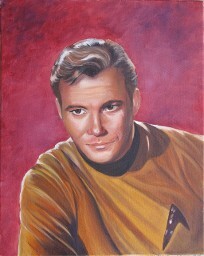 Kirk to be critiqued by Lisa of Lachri Fine Art. Click HERE to see the video of her critique.